The research, carried out by Ming Shi, group leader in MARVEL Design and Discovery Project 6 and senior scientist in the Spectroscopy of Novel Materials Group at PSI, Oleg Yazyev, project leader of Design & Discovery Project 6 and head of the C3MP lab at EPFL and colleagues, has been accepted in Physical Review Letters. The research opens the door for further investigation of this new type of Weyl fermion. 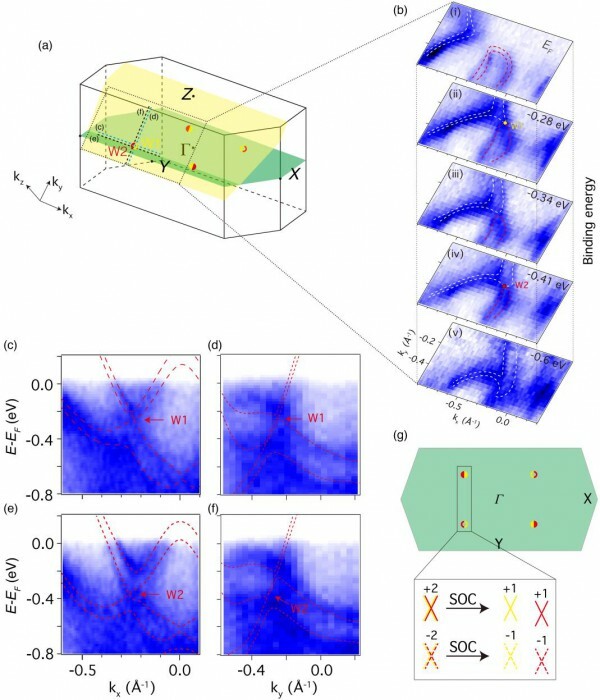 In the past decade, realizing topological phases in solids has become an important subject in experimental condensed matter physics. Among the many kinds of topologically nontrivial materials, Weyl semimetals (WSMs) have attracted a great deal of attention. In such materials, the low-energy excitations (quasiparticles) near the band crossing points (Weyl nodes) behave as massless fermions with non-zero chirality. According to theory, there are two types of WSMs. In type-I WSMs, the low-energy excitations near the band crossing points can be described by the Weyl equation and the quasiparticles are isomorphic to the Weyl fermions predicted in particle physics. In type-II WSMs, the Weyl nodes appear at the touching points of electron and hole pockets. The emerging quasiparticles violate Lorentz invariance and exhibit tilted cone-like low-energy band dispersion. FIG. 1. (a) Crystal structure of WP2. (b) Bulk and surface BZ of WP2 with high-symmetry points labeled. (c) Schematic band dispersions of type-II Weyl nodes in the kx-ky plane of the momentum space. (d) WP2 core-level spectrum, obtained with hν = 650 eV. The concept of type-II WSM has advanced through the study of the topological properties of tungsten ditelluride and molybdenum ditelluride. Great efforts have been made to experimentally identify the spectroscopic evidence of the Fermi arcs—a consequence of the Weyl semimetal phase—as well as to explore the transport properties that could be associated with type-II Weyl fermion excitations. The predicted Weyl nodes lie above the Fermi level though and so interpretations of experimental results are very controversial—it is unclear whether the observed surface states or the transport properties are a direct consequence of the presence of type-II Weyl cones in the bulk. Recently, it has been suggested that the tungsten and molybdenum diphosphide semimetals host robust type-II Weyl fermions with Weyl nodes appearing below the Fermi level. Distinct to all other WSMs, the Weyl nodes in these materials emerge from the splitting of 4-fold degenerate band-crossing points with Chern numbers C = ±2 induced by the crystal symmetries. According to the theoretical prediction, if there were no spin-orbit coupling (SOC), hole pockets and electron pockets would form four touching points located in the -X-Y plane. Each touching point is a 4-fold degenerate linear band crossing point with Chern numbers C = ±2, and all the touching points are well separated from each other in momentum space. When SOC is taken into account, each 4-fold degenerate point splits into two 2-fold Weyl nodes with same chirality appearing at different binding energies. In total, there are eight Weyl nodes in each Brillouin zone. A schematic band structure of two adjacent type-II Weyl nodes contains two touching points of a hole and an electron pocket. The adjacent Weyl nodes, W1 and W2 have the same chirality (C = +1 or -1), while the Weyl nodes with opposite chirality are well separated in momentum space. Because of the large separation of the Weyl nodes with different chirality, two adjacent Weyl nodes cannot annihilate with each other under small perturbations, which ensures that the topologically non-trivial phase of the system is robust. According to the DFT calculation, the Weyl nodes in tungsten diphosphide remain unchanged under positive and negative strain ranging from +4% to -4%. In comparison, for tungsten ditelluride, the Weyl nodes with opposite chirality annihilate for negative strain beyond -0.5%. As a consequence, the Weyl semimetal phase in MoP2 and WP2 is expected to be robust against defects or structural distortions. To see whether or not the theoretical prediction that tungsten diphosphide is a type-II WSM is correct, it was crucial to unveil the Weyl nodes in the bulk electronic structure. Combined with first-principles calculations, the researchers present a comprehensive soft X-ray angle-resolved photoemission spectroscopy (SX-ARPES) investigation. 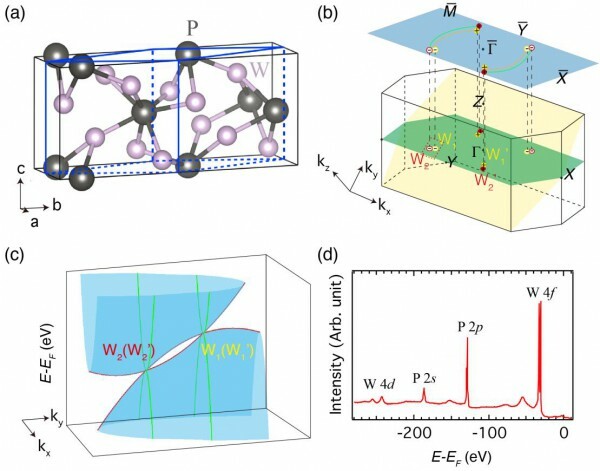 Taking advantage of this bulk-sensitive technique, the study not only provides mainly bulk and higher kz resolution of tungsten diphosphide’s electronic structure, but also for the first time, characterizes its Weyl nodes. In agreement with density functional theory (DFT) calculations, the results reveal two pairs of Weyl nodes lying at different binding energies in the first Brillouin zone. The observation of the Weyl nodes, as well as the tilted cone-like dispersions in the vicinity of the nodal points, provides compelling evidence that the material is a robust type-II WSM with broken Lorentz invariance. The research also opens the door for further investigation of this new type of Weyl fermion.